KeyShot® is a rendering software created by the company Luxion. They have expert knowledge in areas related to daylighting (atmospheric scattering), light scattering by materials (BRDF and BSSRDF models), light transport algorithms such as photon map­ping, and real-time rendering technology. KeyShot is an interactive raytracing and global illumination program developed by Luxion for both PC and Mac that breaks down the complexity of creating photographic images from 3D models. KeyShot is easy to use and gives anybody involved with 3D data the ability to create photographic-quality images in a matter of minutes, independent of the size of the digital model. KeyShot features Scien­tifically Accurate Materials, Multi-Core Photon Mapping, Adaptive Material Sampling and a Dynamic Light Core. These features allow users to see results as changes are being made. In addition to the above, KeyShot also allows you to create your own lights as well as materials in order to have full control over your rendering. The ZBrush to KeyShot Bridge is based on the LiveLinking™ function which connects ZBrush to KeyShot 5. For ZBrush users who do not already own a copy of KeyShot 5, there is a special edition of the renderer, named KeyShot for ZBrush. 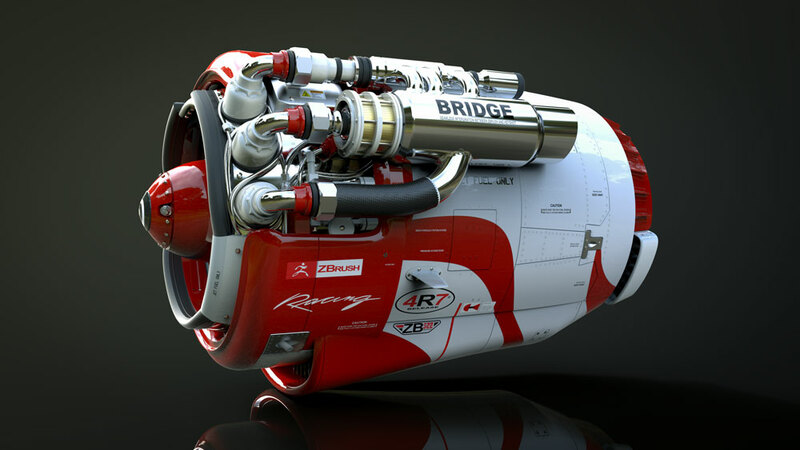 With the Bridge active, KeyShot becomes an alternative renderer for BPR inside of ZBrush. If you are already an owner of KeyShot, you will only need the ZBrush to KeyShot Bridge plugin. This is installed automatically with ZBrush 4R7 and only the license needs buying separately so it can be activated. All versions of KeyShot 5 and beyond are compatible with this plugin. With the combination of ZBrush and KeyShot, you will have another option to almost instantly produce high quality images from your ZBrush models. At any time you can send your models to KeyShot which will then display what you have in ZBrush, including primitives, ZSpheres, ZSketches, geometry and more. This will include the correspond­ing material or MatCap already applied to them. In a way, KeyShot can become your second ZBrush “monitor”. We invite you to visit the KeyShot website for further information and documenta­tion on the application. The ZBrush to KeyShot Bridge plugin can be purchased from the Pixologic web store. Also available is a bundle containing both KeyShot for ZBrush and the ZBrush to KeyShot Bridge plugin. All versions of KeyShot itself (including special licensing options for KeyShot for ZBrush) are available from the Luxion website.